Planets around a distant star don't all lie in the same plane. The eight larger planets in our solar system -- including Earth -- all orbit the sun in pretty much the same plane. Planets located around other stars, called exoplanets, have also seemed to conform to this rule. But a new observation shows that some exoplanet systems are different: the data suggests that some exoplanets orbit a single star in different planes -- tilted relative to each other. 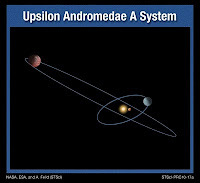 Barbara McArthur, an astronomer at the University of Texas in Austin, reported today the careful measurement of two planets circling Upsilon Andromedae, a star which sits in space about 44 light-years from our sun. Using the Hubble Space Telescope in combination with ground-based telescopes, McArthur and her colleagues determined the masses and the orbital tracks of two of the three planets known to travel around this star. Surprisingly, the two orbits trace out planes that are tilted 30 degrees with respect to each other. "The findings mean that future studies of exoplanetary systems will be more complicated," McArthur said at a press conference today at the meeting of the American Astronomical Society in Miami. "Astronomers can no longer assume that all planets orbit their parent star in a single plane." 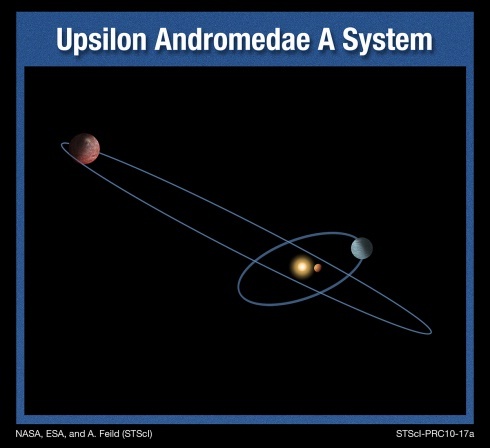 How did the one planet get so much askew from the other planet in this curious system? Astronomers have long thought that such misaligned orbits were not possible. Another speaker at the press conference who had not taken part in the observations, Philip Armitage of the University of Colorado in Boulder, said that in the early life of a planetary system -- when planets form from material left over from the consolidation of a central star -- the inner region of space around the new star is overcrowded as it settles down into a stable form. This stabilization process, which may eject one or more planets, might be responsible for the existence of the one planet orbiting at such an inclined angle, Armitage said. Later planet-planet interactions might also be responsible for the tilt. Discovered for the first time only about 20 years ago, exoplanets have now been spotted in the hundreds. Happy Birthday, Laser! And My Mom! What's Intolerance Got to do with Science? Is Ball Lightning Just A Trick of the Mind?